Kenko is Japanese for ‘health’, and defines Kate Bradley’s passion for food and cooking. 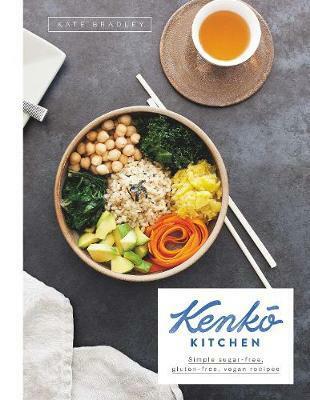 In Kenko Kitchen, Kate Bradley shares a range of healthy and delicious foods that are sugar-free, gluten-free and vegan, as seen on her popular health food blog Kenko Kitchen. Featuring vegan variations for every recipe, a host of gluten- and sugar-free options for those with fructose and gluten intolerances, and delicious raw food, detoxifying and macrobiotic recipes, Kenko Kitchen is perfect for everyone from whole foods newcomers to long-time whole foods devotees, health conscious food-lovers, vegans, and those with dietary intolerances. Think moreish and nourishing breakfast options such as granolas, porridges and homemade vegan yoghurts; light-but-filling lunch options such as roasted vegetable salad with cashew ‘goats’ cheese and walnuts; divine dinners such as garlic and kelp king oyster ‘scallops’ with fettucini and rocket, as well as a host of classic comfort foods with a healthy twist; and sweet treats such as ginger, almond and date biscuits, bliss balls and coconut, fig and pistachio cheesecake.